She was known for speaking against human rights violations and her courageous stand against dictatorships. 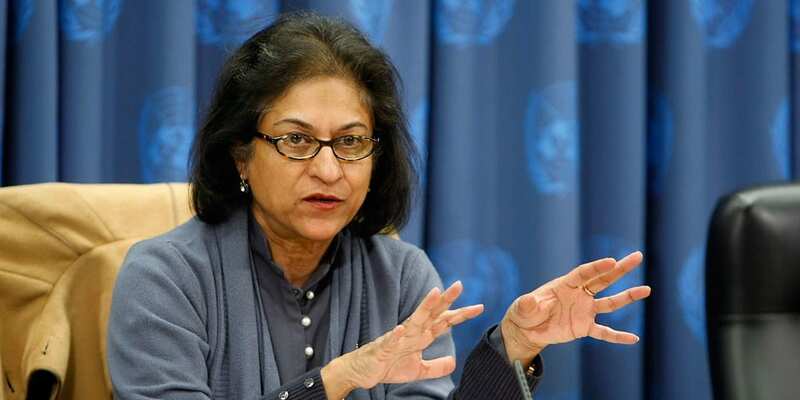 Prominent lawyer and human rights icon Asma Jahangir’s funeral will be held at the Lahore’s National stadium, as thousands are expected to pay tribute to the late human rights activist. Jahangir, who co-founded the Human Rights Commission of Pakistan and came to be known as a fearless voice of the marginalised sections of the society. According to a statement from her family, the lawyer died suddenly after suffering cardiac arrest on Sunday afternoon in the southeastern city of Lahore, her hometown. She was 66. She was known for speaking against human rights violations and her courageous stand against dictatorships. She was also a vocal opponent of judicial overreach and would often confront the superior judiciary when it would extend its jurisdiction in her opinion. Condolences poured in from from Pakistan as well as abroad following Jahangir’s death. As people paid tribute to her services for democracy and efforts in the movement to restore the judiciary. Asma Jahangir was known for taking up court cases of victimised and marginalised sections of society, as well as speaking against human rights violations and her courageous stand against the military rule of General Zia-ul-Haq. Born in Lahore on January 27, 1952, Jahangir completed her bachelors of arts and law from Lahore and then went on to pursue higher legal studies from Switzerland, Canada and US. From 1998-2000, Jahangir served as the special rapporteur of the UN Commission on Extrajudicial, Summary and Arbitrary Executions and was the special rapporteur on freedom of religion or belief of the UN Commission on Human Rights since 2004. Jahangir received several awards and accolades during her life, including the 2014 Right Livelihood Award, 2010 Freedom Award, Hilal-e-Imtiaz in 2010 and Sitara-e-Imtiaz, UNESCO/Bilbao Prize for the Promotion of a Culture of Human Rights in 2010 and Officier de la Légion d’honneur in 2014 – France’s highest award. She taught constitutional law at Quaid-e-Azam Law College, Lahore. Deeply saddened by the death of Pakistan’s iconic human rights activist, #AsmaJahangir. Her courageous struggle for fundamental rights for women and the vulnerable was exemplary and will be the guiding light for our mission. Heartbroken that we lost Asma Jahangir – a saviour of democracy and human rights. The legacy of #AsmaJahangir will live on. One of #Pakistan's greatest strengths is its brave & vocal activist community. Like the country as a whole, it is resilient and will endure. This a huge gesture of support for the WTX News team, it’s not just £5.00 it’s the hugs and kisses that we can’t get enough off. Give WTX a big bear sized HUG!!!! !